Pre Draft Report: Juan Carlos Ramirez was signed out of Nicaragua in July 2005 by Seattle. While scouting reports from prior to his signing are seemingly non-existent, reports from early in his U.S. career depict him as a hard-thrower in the mold of Rafael Soriano, but extremely raw with no secondary offerings to speak of. Career Synopsis: Ramirez made his debut in organized ball in the Venezuelan Summer League in 2006. He threw 65 innings as a 17 year old, allowing just 43 hits and no homers. While he struck out nearly eight batters per nine innings, he also walked close to five. In 2007, Baseball Prospectus ranked Ramirez 10th among Mariners prospects. He moved up to Everett of the Northwest League (short season). He increased his K rate closer to 9.0 (good for 4th in the league), and continued to be stingy allowing hits (61 in 75.1 innings) and homers (3). He was 2nd in the NWL in BAA (.211) and was especially tough against right handed hitters, limiting them to a .185 average. However, his walk rate also increased to 5.1/9. BA ranked him the 3rd best prospect in the NWL and according to a scout, he had the best arm the scout had seen all season, including big leaguers. He pitched in the Arizona Instructional League after the season. Ramirez debuted in BA’s prospect rankings in 2008, showing up at #7 among Seattle’s prospects and moving up to 5th on BP’s list. He spent the season with Wisconsin of the Midwest League. While maintaining a K rate greater than 8.0, Ramirez dropped his walk rate significantly to 2.8/9. He again surrendered fewer than a hit per inning pitched and limited his home runs as well (9 in 124 IP). He allowed three earned runs or fewer in 18 of his 22 starts and was named the league’s 17th best prospect by BA with a scout saying that Ramirez could work at 96-98 mph if he moved to the pen full time. After the season, Ramirez participated in the Mariners’ Advance Development League. In 2009, Ramirez moved up to 5th on BA’s list of Seattle prospects (the same spot as on BP’s list) and moved up to Hi-A with High Desert in the California League. Ramirez’ numbers suffered across the board in ’09, as ERA, hit rate, walk rate, and home run rate all increased and his strikeout rate decreased to 7.0. Some of this is offset by High Desert itself, which sits at 3,000 feet above sea level and is subject to high winds and the California League as a whole is a hitters’ league. To point, Ramirez’ ERA on the road was 3.09 with just two HRs allowed (compared to 5.12 and 18 as a whole). It’s also been pointed out that the increased walk rate was likely the result of more nibbling given the offensive environment he was pitching in. After the 2009 season, Ramirez was added to Seattle’s 40-man roster. Ramirez was listed in BA’s annual as 18th among Mariners prospects for 2010. Post-trade, John Sickels had him 4th among Phillies prospects while BP placed him 11th. 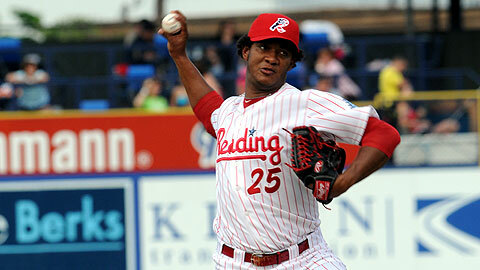 Ramirez began the season in Clearwater and made 11 starts there, pitching fairly well over 64.1 innings. He pushed his K/BB ratio over 3.0 for the first time in his career and once again allowed less than a hit per inning and was tagged for just two homers in that span. He moved up to Reading and made 13 starts there. He kept his K/BB ratio at 2.5, but posted the worst hit (10.3/9) and home run (1.3/9) rates of his career. Immediately following the season, Ramirez had surgery to repair the labrum in his hip. Reports have him ready for spring training and he will be in big league camp. Upside: Ramirez is probably the closest thing the Phillies have to a starting pitcher prospect in their upper levels (depending on what role they envision for Vance Worley). He works at 92-94 and will occasionally get up a couple ticks higher. He has a good slider (which could get better), but his change remains a work in progress. There are also reports that he needs to work on his concentration and on holding runners. Ramirez was originally listed at 175 but is now at 225 and there’s some hope that with the added size, the fastball starts consistently working at 94-95. Ramirez ultimately projects out to a back of the rotation starter or a bullpen arm. Like most of the guys toiling in the rotation at Reading, without a dramatic improvement in 2011, a move to the pen may be the only way he moves into the Phils’ plans in the next couple of years. And then a video of him warming up at Reading in 2010. He has a small hitch in his delivery after he breaks his hands and brings them below his belt, but its not a major issue, it just may impact his rhythm. His problem has been throwing secondary pitches for strikes with any consistency. He does have a somewhat lower arm slot (more pronounced in his Seattle days) which precludes him from throwing a traditional curveball. He’ll need to improve his slider and changeup going forward. He has a solid arm, the potential for mid rotation is still there, but he needs to take a step forward in 2011. Updated to include the great article in today’s Inquirer. His work ethic, both in terms of his craft and learning the language, is excellent. This bodes well for the future. Why isn’t this kid getting strikeouts? Is it a problem?